Brick Oven: Is This Engineered? ‘M3’ was the figure used to track the total amount of money in circulation. 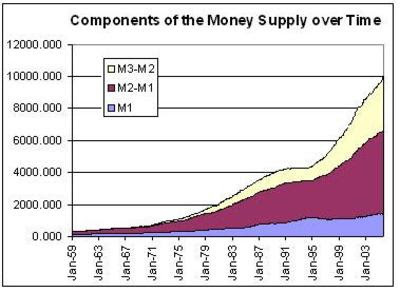 When you look at M3 over time, you can see why inflation goes constantly up; they have kept printing money. The number is $8 trillion in 26 years, or $310 billion per year. On March 23, 2006, the Federal Reserve stopped tracking M3. "M3 does not appear to convey any additional information about economic activity that is not already embodied in M2 and has not played a role in the monetary policy process for many years. Consequently, the Board judged that the costs of collecting the underlying data and publishing M3 outweigh the benefits." Graphs of the number, formerly known as 'M3', would make for some pretty good visuals these days. 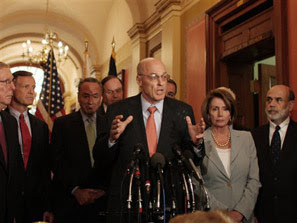 Paulson was in charge of Goldman Sachs, the company that designed many of the CDOs that we are now talking about buying, when they were originated. When those CDOs went bust, Goldman Sachs was not holding significant numbers of them and Paulson had already been confirmed as Treasury Secretary. The public deserves to know what Goldman Sachs knew before we bail out the banking system to the tune of $30,000 per American family. In the absence of an honest discovery period, I say let them fail. We can still probably pick up the pieces in 2008. Delaying things will only make the day of reckoning worse.